Welcome to Solidworks Tutorial for beginners by ShoutMeTutorials.com. Today, you are going to see SolidWorks Loft Boss or Base features tool step-by-step tutorial and how to use this tool for creating different product designs or making 3D models of various shape. This tutorials post shows the basic uses of SolidWorks Loft Boss or Base features and you can apply this feature by following the same step explained below for creating new designs. Before going to SolidWorks step-by-step tutorial, let us see small description about the Loft Boss/Base tool. Checkout Best SolidWorks Training Materials here. What is SolidWorks loft Boss or Base Features? Loft Boss or base is SolidWorks Features tool (like Extrude Boss, Revolved Boss, Sweep Boss etc), which mainly helps to add materials between two or more profiles with ease. The profile should be closed and you can use it for profiles different (e.g. between circle and rectangle) or similar (e.g. between two rectangles or circles) in shape. Loft Boss/Base is mainly located in Solid Works features command manager or in Boss or Base section of Insert Menu. Like all Solidworks Features tool, it also contains property manager called “Loft Property Manager”, which helps to manage the main function of this tool. There are different methods to use the loft option between two or more profiles and completely controlled by the Loft property manager. They are Profiles method, Start/End Constraints, Guide Curves, Centerline parameters and Thin Feature methods. The main uses or application of solidworks loft boss or base tool is that join two or more different profiles of relative sizes, creating tapered models etc. You will see the different applications of Solidworks cad software the upcoming tutorials. Let us see using the profiles methods of Loft boss/base, how to create model in Solidworks. In this tutorial, I am going to use the Loft profiles methods. For drawing sketches, I am going to use Rectangle, circle and Reference plane. Let see how to add materials between one rectangle and circle profiles. The dimensions or sizes of the profiles made as relative to get different shapes. Use the SmartDimension tool in the sketch to adjust dimensions of sketched profiles. In this example, I am using the Rectangle and circle sketch tool for creating profiles. It is not creating in a single plane. So, you need to apply “Reference Plane” Solidwork feature. First, I am going to draw rectangle profile in sketch area default plane “Top Plane” with size of 100 mm in length and 80 mm in width (100 x 80 mm). For that, I use the “center rectangle and SmartDimension tools” and the created profile is shown below. For easiness of view, I just convert the view into Isometric View using the “View Orientation” tool contained in the Solidworks Heads-up toolbar. 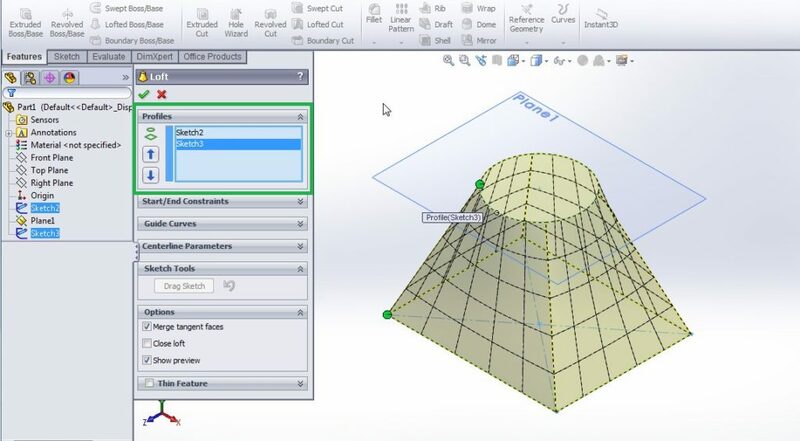 Then “Exit Sketch” and go to Features command manager and click on the “Reference Geometry” and click on the “Plane” from the drop-down menu. If you don’t know it, see how to Create Reference Plane Solidworks tutorial. Then select “Top Plane”, because you have to create plane parallel to the created rectangular profile in Top Plane. Set the distance between the Top plane and new plane as “70 mm” and click on the Green tick button to conform it. Here I am only showing two profiles lofting, so no need to create additional planes. Go to Insert Menu and select the “Boss or Base”. Then you can see side drop down menu and from that select “Loft Boss/Base” feature. Click on the Loft Boss or Base feature button either from command manager or insert menu. Then you can see the Loft property manager. You have to use the “Profiles” section of the loft property manager. Then click on the “Sketch 2 and sketch 3” from the Featuremanager design Tree. And click green tick button to confirm your action. Then you can see the lofted body between circle and rectangle profiles. You can also apply other methods to create different shapes by using Loft Boss or base property manager. I will try to update the Loft Boss or base tutorial by adding the other methods to create different models. This tool is very useful when you are going to create complex shapes.